Tottenham say it is "wholly inaccurate" that they have contacted Ajax over the availability of coach Frank de Boer. On Tuesday, a spokesman for the Amsterdam club stated that Spurs had made an enquiry. "Reports we have made approaches to other clubs regarding coaching staff are wholly inaccurate," a Tottenham spokesman told BBC Sport. "We've not contacted any club regarding coaching appointments. We regret that a statement such as this is necessary." The Ajax representative had told BBC Sport that Spurs approached their director of football Marc Overmars by telephone within the past month. Current manager Tim Sherwood, who succeeded Andre Villas-Boas in December, is under contract at White Hart Lane until the end of the 2014-15 campaign. The club are expected to review his progress at the end of the season. 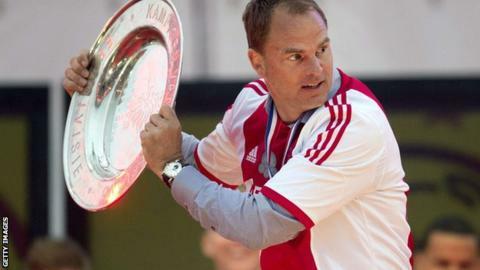 On Sunday, De Boer led Ajax to a fourth consecutive Dutch title since he took over in 2010 and a 33rd in their history.